The division deals with high profile cases such as murder, fraud and serial sexual assaults, serving over 1,000 employees including civilian members and police officers. Their work supports major investigations by efficiently processing, organizing, indexing, and ultimately disclosing to the courts, large quantities of information derived from investigations. Databases currently hold some 600 sensitive files that include evidence, images and written documents for operational investigations that will be used for prosecution in crown court. At any one time up to 200 police officers, administrators and data entry staff can open these sensitive files concurrently. Given the sensitive nature of these documents, which are often vital pieces of evidence, the organization could not risk the files being tampered with or altered in a way that could deem them unsuitable for use in court. If the defence is looking for holes in the evidence it may ask to see how the document has been handled in the investigatory phase. As a result the IT team needed to be able to track who was making changes to the documents, monitor shared folder access and recover lost work. The team had previously been using Windows Server Audit, Microsoft’s own built-in back office file auditing system, but the capabilities were limited and did not provide the control they desired. With IT systems of today allowing evidence to be digitized, investigators can get ready access to information they need for review rather than manually going through thousands of physical files. This enables them to make timely and efficient decisions, a necessity when successfully prosecuting a criminal. However this fast access to data must be tracked and monitored, so access to crucial information can be reported on. The IT team administrators began the search for a Windows-based solution that would allow the department to monitor network access. They needed to be able to monitor, track and record file usage. An online search led the team to IS Decisions product FileAudit. The team discussed it with its headquarters and found another division within the wider organizaiton had recently purchased FileAudit and was very happy with the software. In less than a week, the team was able to deploy FileAudit for its 1,000 users, across seven servers. The IT Team easily set up what was needed to track within the back office system. 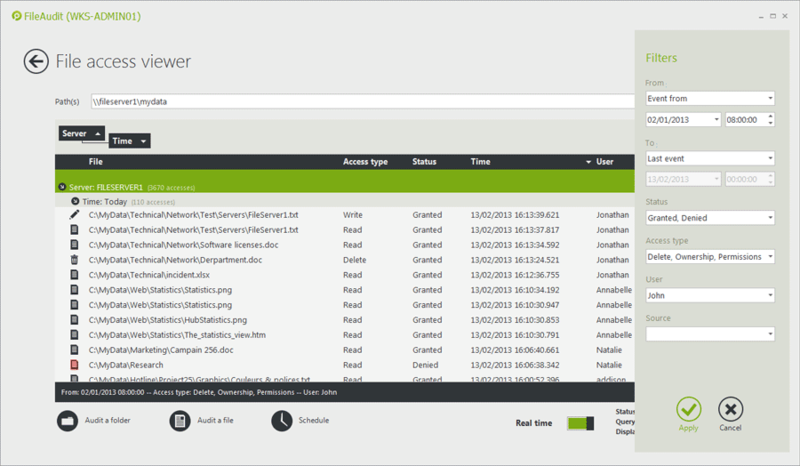 FileAudit allows the department to see file ownership changes and permission modifications in real-time. Currently the department is tracking file changes and deletes but will be able to tweak the system at anytime to track even more granular detail. The team is currently getting feedback from police officers to see if they can use the technology to monitor systems in other ways too. Through FileAudit’s monitoring capabilities for its Windows network, the organization has been able to audit and monitor usage of sensitive files.